Discussion in 'Yanks Abroad' started by bshredder, Apr 4, 2014. The whole situation with Reading is weird, because they could clearly use him. If they don't sign Oliveira permanently, he seems like he should be their starting center forward. Given that they've loaned him out while not having good options at the position, it suggests that the club doesn't rate him at all. or they locked into this before they were fully aware of their needs. They could have used him last year, too, so I don't buy that. They had one CF with double-digit goals in all comps, no one else had more than 2. This year isn't any better. If they're loaning him out in consecutive years when their forward situation has been as it is, they don't rate him. Or, at least, they didn't as of the summer. Maybe this season will change some minds. It's always real interesting to me some clubs pick up players and then try to dispose of them in whatever way they can. And maybe they don't rate them or so. But it's like, "why did you pick them up if you didn't rate them at all?" I can get Chelsea or Juventus needing depth. Clubs that face relegation needs to have every upmost in whichever play they sign. Rumours are spreading. I hope it's not a spin off ofmy posts in here. De toekomstige Feyenoord-trainer Jaap Stam heeft een opmerkelijke versterking op het oog, meent RTV Rijnmond-verslaggever Sinclair Bischop. 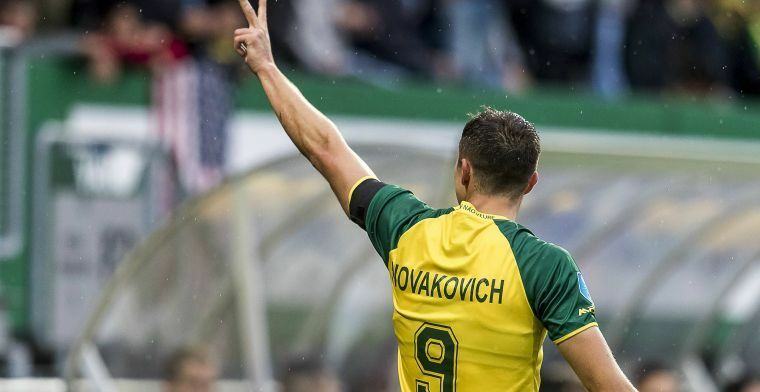 Volgens de journalist wil de Rots van Kampen volgend seizoen samenwerken met Fortuna Sittard-spits Andrija Novakovich. sakibomb523, Winoman and LouisianaViking07/09 repped this. Guess this will be picked up from this thread by Yank media? Tbh. the guy hasnot got an impressive track record in being spot on in rumours. "Bij de heren valt echter wel een opvallende naam: “Ik hoorde een gerucht dat Novakovic, daar heeft hij mee gewerkt bij Reading, die spits van Fortuna dat hij die graag zou willen halen”, aldus Sinclair Bischop. “Die heeft natuurlijk al gescoord in de Kuip dit seizoen”, reageert Frank Stout." "Amongt he gentlemen, however, drops a striking name: "I heard a rumor that Novakovic, he (=Stam) worked with it at Reading, that striker of Fortuna that he would like to get him," said Sinclair Bishop. "Of course, he already scored in De Kuip this season", Frank Stout responds." This guy is completely unreliable, given this comment. First Jaap Stam isnot involved and doesnot give opinions on players for next season. Second Jaap Stam's only commitment with Nova was his sending him to Telstar to get experience. He hasnot worked with him. Third he cannot have heared anything about it as none of the real Feyenoord watchers (=the ones with access to Feyenoord inside) havenot mentioned anything about him. In fact the only one ever discussing him as an option for Feyenoord is me, no one else. Well, at least you're known as a gentleman. Yeah, that whole Feyenoord thing was a joke or something. Funny, right? WheezingUSASupport, Winoman and BostonRed repped this. Well, at least you know now you can safely trust me when I call someone an unreliable source. Jazzy Altidore, LouisianaViking07/09 and Winoman repped this. The biggest joke will be when Jaap actually comes up with him next season. Then he will look major silly. Winoman and LouisianaViking07/09 repped this. For the life of me, whenever there's a twitter thing like that, I can't understand who said what, when, and who responded to whom. It's all just information with no context for me. Not to mention I know even less about why I should care about the opinion of @douchenozzle36. Is he a professional scout or something? Or just a random douchenozzle, the 36th in a long line of douchenozzles? Magikfute, Gorky, Winoman and 1 other person repped this. UniversalAdvice and Winoman repped this. btlove, sakibomb523, WheezingUSASupport and 10 others repped this. Fortuna got jobbed today: soft red (+penalty), second soft penalty, and a real penalty. It's ending 3-2 to the locals, Willem II. The ref didn't call anything in favor of Sittard, and Nova suffered a couple of bad fouls that should have been yellows. sakibomb523, WheezingUSASupport, LouisianaViking07/09 and 2 others repped this. 8th league goal. A goal every 3 matches is pretty decent. I'm starting to get a bit enthusiastic about the guy. Still, it's the Eredivisie, you need to score 20+ there to enter the radar of the big guns. The Persian dude who scored 21 last season (low for a top scorer there) only made it to Brighton. I kinda wonder if some of that might have been to his background or hesitancy behind a one-hit season. Actually, he's 37th Of His Name. USSoccerNova and LouisianaViking07/09 repped this. Tom Collingsworth, Winoman and LouisianaViking07/09 repped this. Get that goal young blood. Looks like Sittard committed another early red card offense. So at that point it's Novakovich helping Fortuna hold-up, hang on, and trying to take advantage of the occasional chance on the break. Apparently things were going well for Sittard up until that point. They do this way too much. It was the Real Madrid guy who out of the blue decided to elbow his opponent. What's the use of loaning such imbecils that cost you dire points instead of contributing to gain them. Tom Collingsworth, TxEx, m vann and 3 others repped this.